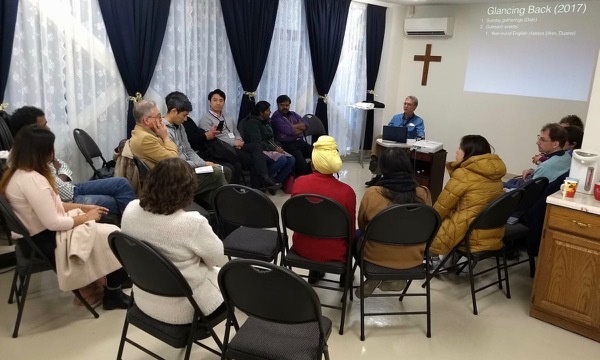 In Jan 2019 Dale took on the part time role of Asia Director/Facilitator of the Evangelical Free Church of Canada Mission. The idea is for Dale & Ann to visit EFCCM personnel in Asia once a year. Dale will also likely visit them at other times as well. 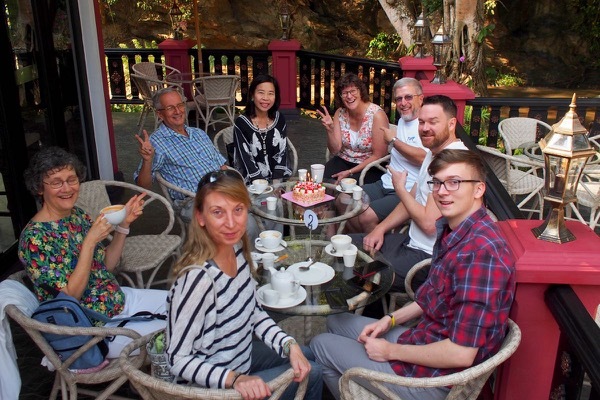 Our first trip was to Chiang Mai, Thailand for six days in late Jan. What a privilege to connect with missionaries engaged in Christ-centered ministry in another Buddhist country! We hope we were able to encourage them. For the first half of this year we will likely be traveling to various countries on a monthly basis as Dale walks through his learning curve. TMC Christmas Sunday worship service on Dec 23 included Christmas carols and Japanese interpretation of the English sermon. After enjoying a potluck lunch some TMCers went caroling at our nearby park and train stations while offering gift bags for children. They also handed out invitations to our Christmas Eve candlelight service, which was entirely in Japanese. Dec 24 happened to be a Japanese holiday in 2018. 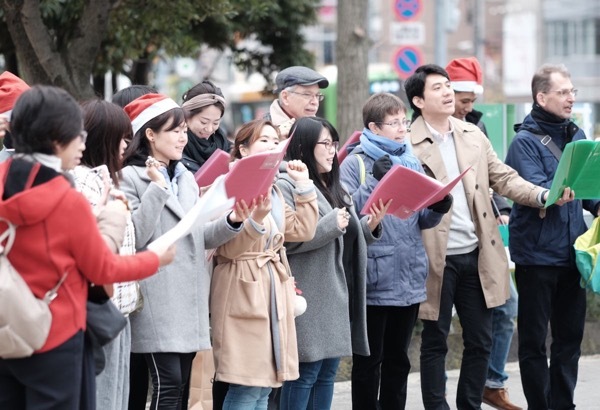 This kind of Christmas outreach event is typical for churches in Japan because even non-Christians are interested in Christmas. Our hope is that these kinds of events will move us toward launching a Japanese language worship service next year. Ann led our family Christmas event on Dec 16, with the help of a number of TMCers. She had lost her voice due to a virus a few weeks earlier and was still recovering, so she was delighted with all the help. 18 children (27 were invited), 10 moms, and 5 dads showed up. It was very noisy and chaotic at times, but it was happy noise and chaos! The children watched a Christmas segment of the Super Book video in Japanese with subtitles in English. A TV channel in Japan is showing Super Book segments on Sunday mornings in Nov and Dec.
One of our TMC mothers who lives in our neighborhood near TMC invited two of her friends who are also moms. One was able to attend. It was the first time for this mom and her children to be at TMC. We hope they will be able to come again in order to hear about Jesus. 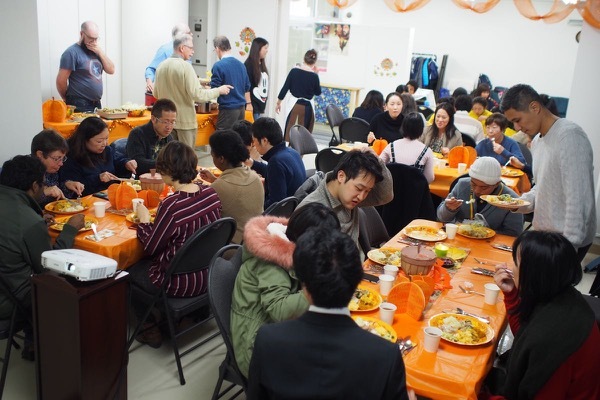 Our American Thanksgiving dinner at TMC was Nov 25, aligning with a national Japanese holiday. Janet D., an Overseas Missionary Fellowship missionary who attends TMC, gave a biblical perspective in Japanese on giving thanks. We were pleased that one lady in Ann’s English class came for the first time to this TMC non-English event. Tokyo Multicultural Church’s O-san passed away unexpectedly of a heart attack in September at the age of 59. 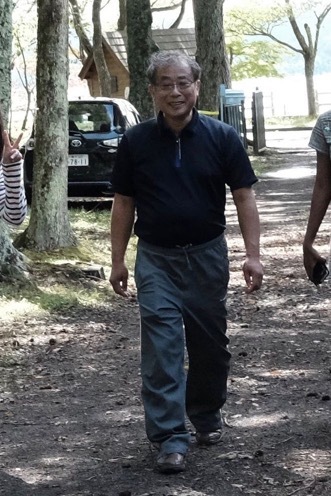 He was probably the most central member of our Japanese Department. He has left a big hole in his family and at TMC. We are thankful for the many happy memories of O-san, especially at our fall retreat just days before he died, where the pic was taken. We are more thankful that his wife and grown daughters share in the hope of resurrection and eternal life in Jesus Christ. Mr. O. attended TMC but the rest of his family are at a different church. We were able to hold a TMC fellowship time for them and many from TMC were able to share their fond memories of him to encourage them. We look forward to a grand reunion in heaven. Revelation 21:4— He will wipe every tear from their eyes. There will be no more death or mourning or crying or pain, for the old order of things has passed away. 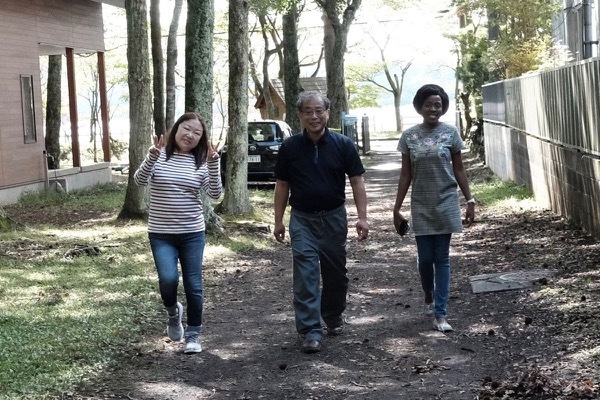 TMC's first retreat was Sep. 15-17 at Yamanaka Lake, Yamanashi-ken, one of the lakes around Mt. Fuji. What a treat to get away to a beautiful area near Tokyo with our church family! We’re quite sure this is going to become a TMC tradition. 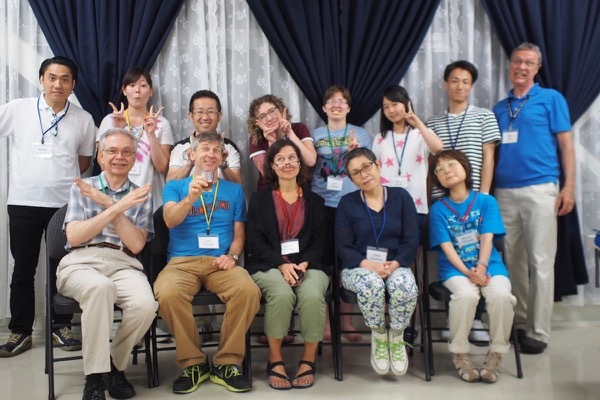 According to a colleague’s recent newsletter, after S-san finished elementary school she stopped attending worship services and Sunday school led by missionaries at their nearby home. Reading between the lines, she fell prey to the busyness of life in Japan and the pressure to conform to the materialistic values of animistic Buddhist Japanese society. As an adult she neglected and repressed the work God had done in her heart during her formative years as a child. TMC’s July 23-27 outreach English classes have been cancelled because of lack of short term teachers. 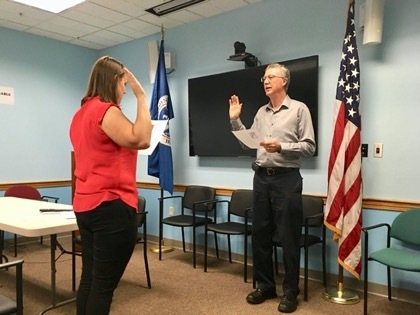 The good news is that we have some possibilities for teachers next summer (2019)! How many people did you lead to Christ in your missionary ministry last year? 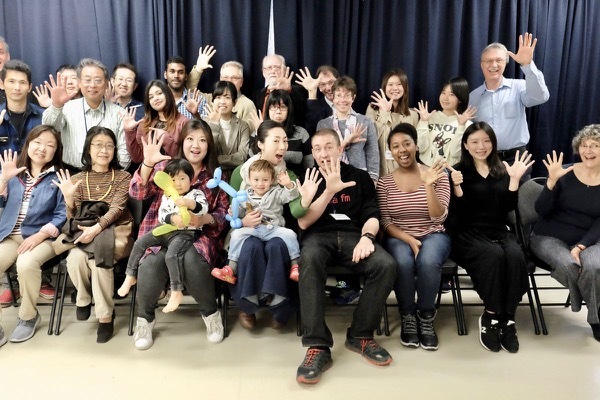 TOKYO MULTICULTURAL CHURCH quietly turned 5 years old on April 8, the Sunday after Easter. Thus the many hands showing five fingers in the above pic. We (Dale & Ann) launched TMC on Sunday Apr 7, 2013 in our apartment complex’s meeting room with eight people in attendance, including a core group of six. On Easter Sunday 2018 we had 50 people in attendance, including quite a few visitors. 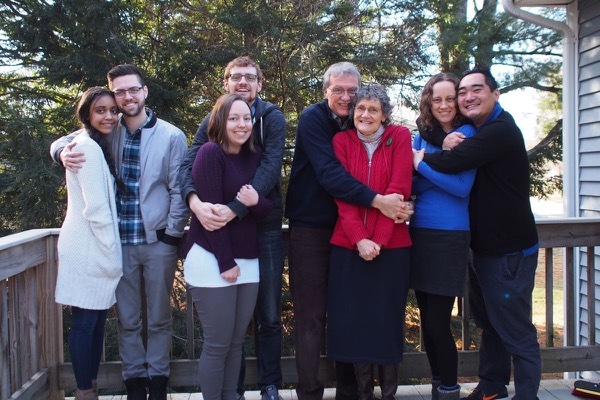 TMC now has a missionary staff of seven (4 households), serving with the EFC of Canada Mission (EFCC-M), ReachGlobal (EFC of America), and the EFC of Macau. 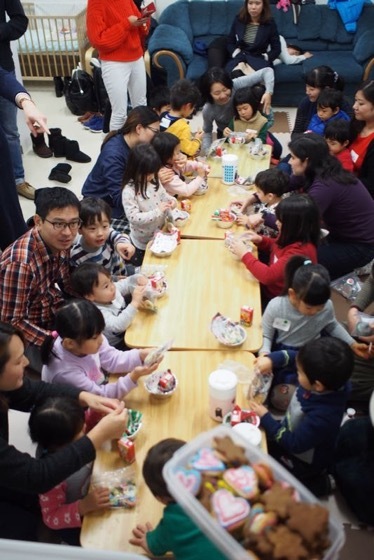 Sundays include Japanese Sunday school for children and adults, English worship service (with sermon translated into Japanese twice a month), and a monthly Chinese (Mandarin) fellowship. Our desire is to launch small groups and a Japanese language worship service in 2018. 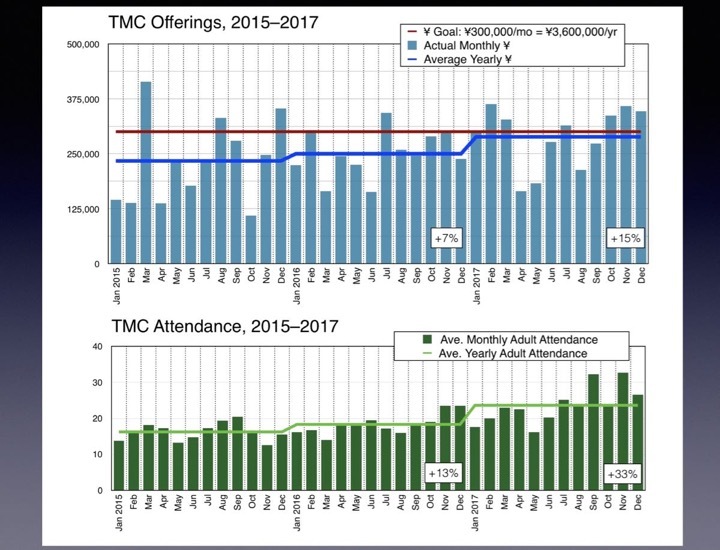 Lord willing, we will launch and establish second and third TMC’s in the world’s largest megacity of Tokyo located within Japan, the second largest unreached people group on planet earth.